The birthplace of Akiyama Brothers (秋山兄弟生誕地) is one of main feature of Matsuyama. Akiyama Brothers, Yoshifuru and Saneyuki, were ones of greatest Generals in Japan. They house was used to be located in this place. There is a house restored based on the photo of Akiyama Family. It displays the Akiyama related materials. The well is the same as it was used to be. There is no parking, but is restroom. Admission: 300 for adult. Free under high school. Time: 10:00 to 17:00 (last entry 16:30). 1. use street train to Okaido. The house of Akiyama Brothers was burnt down during WWII. The current house was restored based on the photo and opinion of descendants. The well is located at the same location. Yoshifuru's favorite fruits, fig is planted next to the well. Akiyama Brothers are the most important military officers who lead Japanese Imperial Military win against Russian Imperial Military in Russo-Japan War. 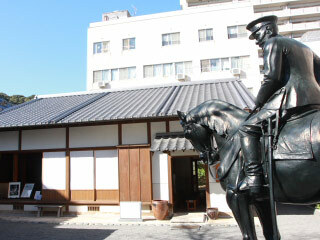 Yoshifuru was the founder of Cavalry of Japanese Imperial Army. He lead his Cavalry and defeated Russian Cossack Cavalry in Russo-Japanese War. After he retired, he became the principal of Junior-high in Matsuyama. He spent his life to educate the youth. Saneyuki is the best Military Staff Japan ever had. He was the main Military Staff of Imperial Fleet of Admiral Togo in Russo-Japanese War. He planed the tactics of Battle of Tsushima, and lead the Japanese fleet win. The Japanese fleet won perfectly. They sank all the battle ships of Russian Baltic Fleet. "The meaning of his life is defeating the strongest cavalry in the world." evaluated by French Officer. Yoshifuru was born in 1859 at Matsuyama. Because Akiyama family was the low rank Samurai, to support his family, he entered the university of education in Osaka. In 1877, he joined the military academy of Japanese army. In 1879, he graduate the academy and join the army as the lieutenant 2nd. In 1887, he went to France to learn French style Cavalry. He came back in 1891, and joined Japanese Cavalry. In 1894, Yoshifuru lead his cavalry at the Sino-Japanese War. In the Russo-Japanese War in 1904, he promoted to the major general and became the commander of IJA 1st Cavalry Brigade and fought at the battle of Shaho, the battle of Sandepu and the battle of Mukden. His cavalry defeated the Russian Cossack Cavalry. As a result, Japanese Empire won against Russian Empire. He promoted to General and retired in 1923. He went back to Matsuyama and became the prime minister of Hichschool. He spent lest of his life to train and educate the youth and died in 1930. He was 72 years old. "Stay poor and hungry, only hard experience and suffering physically and mentally make human strong and grow." "Erase the evil mind. The evil mind produce an ego. Ego blinds you the entire vision. Erasing the evil mind is the most important for stepping to next stage." Saneyuki was born in 1868. The same as his big brother Yoshifuru, he entered the navy academy because it was free. In 1890, he graduated first on the list of the academy and joined the imperial navy. He became the crew of Battleship Hiei and helped the accident of Ottoman frigate Ertu?rul. In 1892, he also joined Shino-Japanese War. In 1898, he went to the USA and joined the US Navy Academy. Saneyuki became the student of Alfred Thayer Mahan and learned the tactics and strategy of Navy at the library. He came back to Japan at the same year. In 1901, he became Lieutenant Commander of Japanese Navy, and promoted to Commander. In 1904, the Russo-Japanese War began. He was chosen as the chief staff officer of Admiral Togo Heihachiro who is the Admiral of Japanese Fleets. He planed many tactics and support Admiral Togo. In the Battle of the Sea of Japan, he planed the tactics of Togo Turn and defeated all battleships of Russian Baltic Fleet. This victory lead Japan won at the Russo-Japanese War. In 1908, he promoted to Captain. In 1914, he became Adjutant Admiral of Navy Minister. He supported to built new Battleships. In 1916, to observe WWI, he went Europe. He promoted Vice Admiral of Japanese Navy. In 1917, Saneyuki died. He was 49 years old. "The weather is excellent, but the waves are very high." at the Battle of the Sea of Japan. "The fortune of the destiny gives the victory and growly to the person who has disciplined all the time until strong enough to win without competing or fighting. However, it would take away the growly immediately when the winer satisfied with a victory. Old Samurai said that staying in focus and be ready for the next battle after a victory." by Admiral Togo at the dissolution of Japanese Fleet, and Saneyuki wrote this script. At 13:39 p.m., May 27th, 1905, the main force of the Japanese Fleet sighted the Russian Baltic Fleet approaching from the southwest in two lines ahead at a distance of approximately 13km. ADM Togo decided to attack the enemy fleet from the front port line, while he headed his fleet westward. At 13:55 p.m., ADM Togo hoisted the famous "Z" Signal Flag Meaning "The rise and fall of the Empire depend on this battle. Let every man do his utmost." At 14:02 p.m. ADM Togo set the course of the Fleet to the southwest, took the position of reverse action run to the port side, and started to close in heading southward. ADM Togo, standing on the MIKASA's bridge with his left hand holding noted sword forged by the great sword smith, a gift from The Crown Prince, started at the rapidly approaching enemy fleet and waited for the right opportunity to bear down the enemy's leading ship. At 14:05 p.m., with the enemy front at 8 km, he gave the order for a great turn, so called "Togo-Turn."